Why Automatic Plastic Bottle Bagging Machine? Automatic Pet Bottle Bagging Machine is the perfect labor-saving component to meet the demands of high-speed Packing Lines. Machine is designed to form a matrix of containers (i.e. 8x8; 6x8, etc) and push the complete matrix in to the bag for packing. No longer are employees required to manually place the bottles one by one in the bag with proper arrangement – an otherwise tedious and time consuming task. 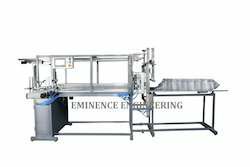 Why Automatic Pet Bottle Bagging Machine? • No changeover parts at bottle changing which provides minimum time for bottle changeover. • It can workout for any shape like round, oval, square, etc. It is enable for unsymmetrical shape of bottles also.